Certainly was a glorious weekend there back at the end of September last year and here I was out on another wedding “double header” yet again – the previous day at The Cruin (check it out guys), followed by my first ever visit to the fabulous Crossbasket Castle for Joanna & Jonny’s big day :-). It’s a funny thing (or maybe not depending on your point of view), but I must’ve driven past Crossbasket hundreds of times before without actually knowing it was there, well hidden that it is from the main drag. but boy, what a venue! Of course, as usual my day kicked off with a wee bit of bridal prep, as you do, followed by a trip to the impressive Motherwell Cathedral (another first) for the ceremony. Always great to see a few familiar faces amongst the other suppliers too – Dominic at Reflections, Caledonian Cowboy and the guys in Franco, who I’m sure will have rocked the joint well into the night! Oh man, The Cruin… I just love it there…one of my favourite venues. So guess how delighted I was to be shooting there again in the last days of last summer…yep, you could feel that wee chill in the air as the sun went down with autumn just around the corner. 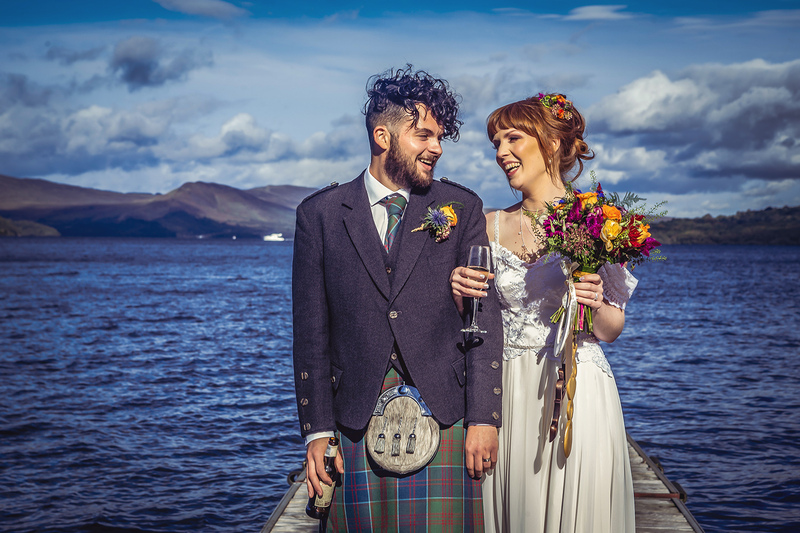 Set on the banks of Loch Lomond, it’s a truly spectacular setting for a wedding day and what glorious weather we were blessed with too…although even in the rain and murk I still think it looks great…very atmospheric and mysterious, if that’s the right word to use! I’d not actually met Sonia & David until the day itself but that’s never been a problem before, and certainly wasn’t this time around either, as I quickly settled in to things with the bridal prep shots and, as everyone was getting ready in the grounds of The Cruin, a few quick shots with the guys as well…always a bonus :-). No wedding at The Cruin, is complete without some shots on the (very long) jetty – get’s more bouncy the further out you go :-). But boy…that backdrop…plus blue skies and clouds…just perfect conditions. And let’s not forget the glorious early evening skies as well as we ventured out after dinner for a few final shots before the evening part kicked off. You know guys, it’s kind of unusual that, for the second post in a row, I’m featuring another wedding with just a handful of guests. Now, when it comes to weddings, there’s no rule book that says that you must have upwards of 75 guests, although to be fair, most that I shoot do have that kind of number, sometimes more than 100…I think 185 was the largest I’ve ever shot! Susan & Chris’ big day was another of my April weddings last year, and took place at a venue fairly local to me, the Grange Manor Hotel, which was also to be the first time I’d shot a wedding here, although I’d been here before for a couple of trade shows, so knew my way around well enough…always useful :-). There’s something very relaxing about more intimate weddings (think there were about 20 in number in total) – there’s not the usual big list of group shots for starters leaving everyone free with much more time to just mingle and chat, which definitely suits my shooting style on the day…photo “ninja” that I am :-). But, of course, I’ll always make time for a few bride & groom shots…very chilled, natural stuff…just go with the flow kind of thing. And, due to the vibe of the day, we managed to fit in two short sessions, one before and one after dinner. 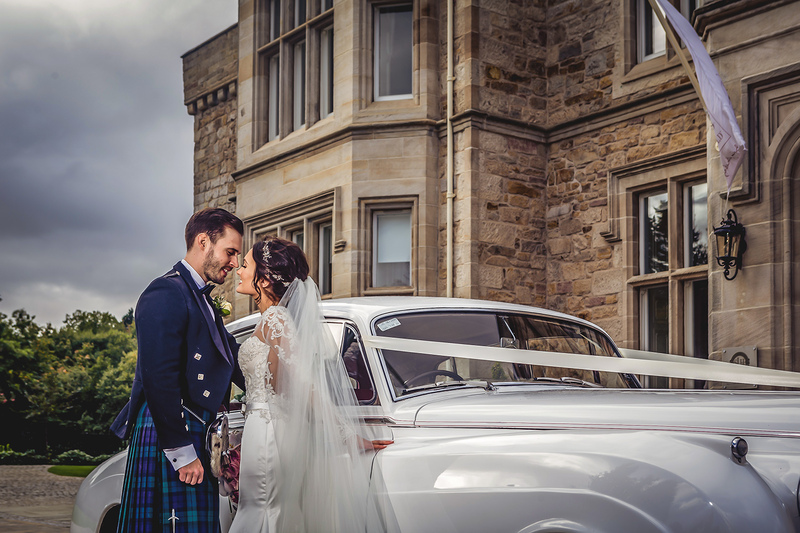 April was defo a busy month for me last year with seven weddings in total to shoot, the fourth of these being my first ever visit to Cromlix Hotel for Emily & Dave’s big day…and what a fabulous day :-). 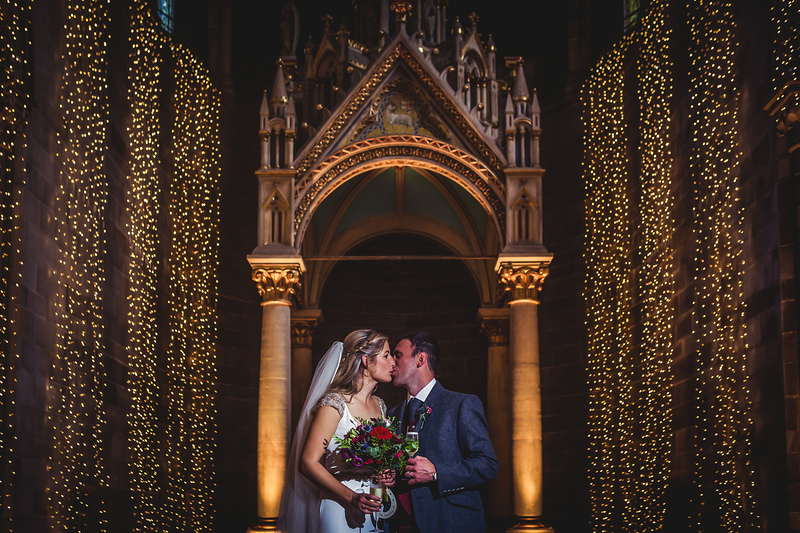 Cromlix was acquired a few years back now by tennis star Andy Murray and what an amazing venue it is, even boasting its own small chapel where the ceremony was held. 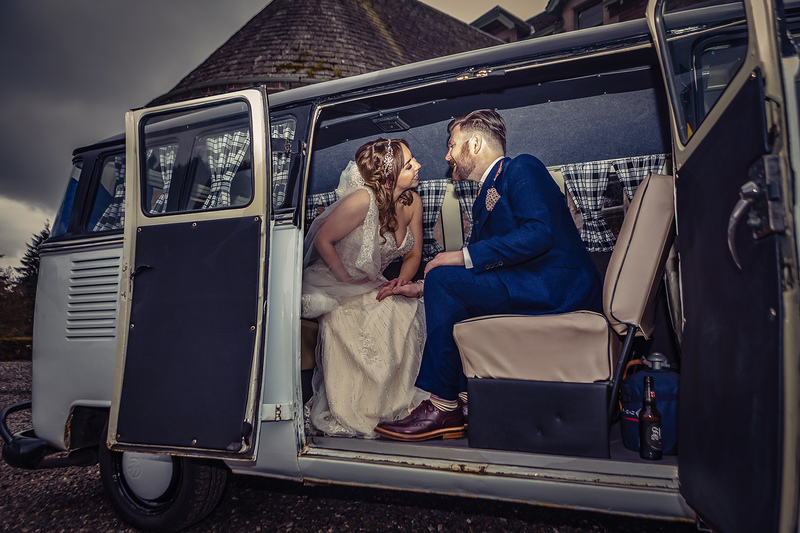 The wedding itself was a very intimate affair to kick off with, with just close family and friends in attendance for the ceremony and wedding breakfast, but they were joined by many more later on for the evening party at the Avonbridge Hotel. 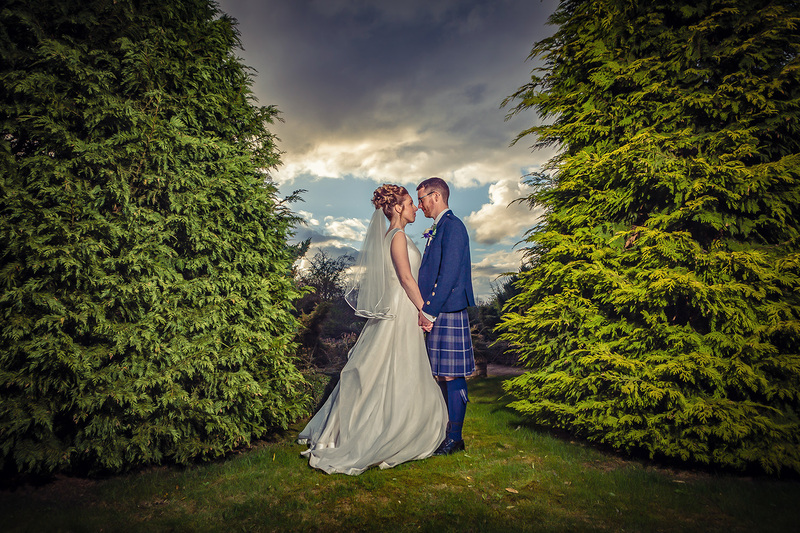 Much of the day was, as usual, shot in my very observational style but we did make time for a very short bride & groom shoot in the chapel at Cromlix before the guys headed off in the VW Camper for the party :-).